Ph.D. Telecommunications Engineering, 1998. University of Vigo. M.Sc. Telecommunications Engineering, 1993. University of Vigo. Visiting PhD Student, 1994, University of Manchester, UK. Sponsored by Erasmus Program. Visiting PhD Students, 1997, Rice University, Houston, TX. Sponsored by Fundación ProVigo. Visiting Professor, University of Ne Mexico, Albuquerque, NM. Sponsored by Spanish Ministry of Education. 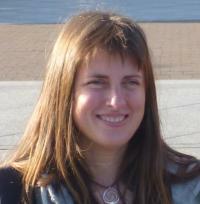 M. Elena Domínguez Jiménez, 2001, "Design of signal extensions for wavelet processing" (Best PhD thesis UPM 2001). Currently at Universidad Politécnica de Madrid.